Fate: Sank at 8:40 pm on 24 January 1909 after a collision with SS Florida at 5:40 am the previous morning. Draft: 34 ft 1 in (10.39 m) . RMS Republic was a steam-powered ocean liner built in 1903 by Harland and Wolff in Belfast, and lost at sea in a collision in 1909 while sailing for the White Star Line. The ship was equipped with a new Marconi wireless telegraphy transmitter, and issued a CQD distress call, resulting in the saving of around 1,500 lives. Known as the "Millionaires' Ship" because of the number of wealthy Americans who traveled by her, she was described as a "palatial liner" and was the flagship of White Star Line's Boston service. This was the first important marine rescue made possible by radio, and brought worldwide attention to this new technology. The ship was originally built in Belfast, Ireland for the International Mercantile Marine's Dominion Line (a sister company to the White Star Line) and was named Columbus. She was launched on 26 February 1903 and made her maiden voyage in October 1903 from Liverpool to Boston. After two voyages with the Dominion Line, Columbus, along with three other Dominion liners; New England, Commonwealth and Mayflower were sold to the White Star Line for use on their new service between Liverpool and Boston. Columbus was renamed Republic, the second ship under White Star livery to hold the name (White Star's original Republic of 1872 had been sold to the Holland America Line in 1889 and renamed Maasdam), while her three fellow former Dominion liners were renamed Romanic, Canopic and Cretic respectively. Republic made her first crossing under White Star from Liverpool to Boston on 17 December 1903, arriving in Boston 27 December. In January 1903, she made her first crossing from Boston to the Mediterranean via Gibraltar, making calls at Sao Miguel in the Azores, followed by the Italian ports of Naples and Genoa, and ending at Alexandria, a voyage which often took up to three weeks to complete one-way. In November 1904, she inaugurated White Star's Mediterranean-New York service. White Star intended this route for two purposes; first, they sought to establish a market for cruising opportunities for wealthy American passengers, as her spacious and luxurious accommodations in first and second class attracted scores of wealthy vacationers, thus earning her the nickname "The Millionaire's Ship". Second, and more predominantly on her westbound crossings, White Star sought to tap into the massive Italian immigrant trade. Republic, with a third class capacity of 2,000, proved to be immensely profitable on this route, as when she sailed for the United States on any given trip, third class was often booked to capacity, and sometimes beyond. A vast majority of Italian immigrants who sailed by White Star boarded Republic and the other ships at Naples, along with smaller groups of Greeks, Austrians, Slavs, Turks and Syrians. White Star's placement of Sao Miguel on their Mediterranean services opened them up to traffic from Portuguese immigrants as well. Over the next four years, Republic spent the winter and spring months running on White Star's Mediterranean-New York service alongside the Cretic, while during the summer and fall months she sailed on the Liverpool-Boston route together with Cymric and Arabic. In early morning of 23 January 1909, while sailing from New York City to Gibraltar and Mediterranean ports with 742 passengers and crew and Captain William Inman Sealby (1862–1942) in command, Republic entered a thick fog off the island of Nantucket, Massachusetts. Amongst the passengers were plenty of illustrious people such as Mrs. Sophie Mansfield Curtis, wife of George Munson Curtis (treasurer of the International Silver Company), Mrs. Mary Harriman Severance, wife of Cordenio A. Severance, Professor John M. Coulter with wife and children, General Brayton Ives, St. Louis millionaire Samuel Cupples, historian Alice Morse Earle, and Mildred Montague, Countess Pasolini. Travelling in first class were also Mr. Leonard L. McMurray, who, in 1915, would survive the sinking of the Cunard liner Lusitania, and Mrs. Bessie Armstead Davis, daughter-in-law of senator Henry G. Davis of West Virginia with two children. This picture of SS Florida was taken by Martin & Ottaway, a New Jersey marine consulting firm, after Florida collided with Republic. Florida survived the collision and was repaired in 24 days. Taking standard precautions and maintaining her speed, the steamer regularly signaled her presence in the outbound shipping traffic lane by whistle. At 5:47 a.m., another whistle was heard and Republic's engines were ordered to full reverse, and the helm put "hard-a-port". Out of the fog, the Lloyd Italiano liner SS Florida appeared and hit Republic amidships on her portside, at about a right angle. Two passengers asleep in their cabins on Republic were killed when Floridas bow sliced into her, liquor wholesale manager Eugene Lynch's wife Mary and banker William J. Mooney. Eugene Lynch was critically injured and died as a result of his injuries at Long Island College Hospital, Brooklyn, 26 January. On Florida, three crewmen were also killed when the bow was crushed back to a collision bulkhead. Six people died in total. The engine and boiler rooms on Republic began to flood, and the ship listed. Captain Sealby led the crew in calmly organizing the passengers on deck for evacuation. Republic was equipped with the new Marconi wireless telegraph system, and became the first ship in history to issue a CQD distress signal, sent by John R. Binns. Florida came about to rescue Republic's complement, and the U.S. Revenue Cutter Service cutter Gresham responded to the distress signal as well. Passengers were distributed between the two ships, with Florida taking the bulk of them, but with 900 Italian immigrants already on board, this left the ship dangerously overloaded. The White Star liner Baltic, commanded by Captain J. B. Ranson, also responded to the CQD call, but due to the persistent fog, it was not until the evening that Baltic was able to locate the drifting Republic. Once on-scene, the rescued passengers were transferred from Gresham and Florida to Baltic. Because of the damage to Florida, that ship's immigrant passengers were also transferred to Baltic, but a riot nearly broke out when they had to wait until first-class Republic passengers were transferred. Once everyone was on board, Baltic sailed for New York. At the time of Republic's sinking, ocean liners were not required to have a full capacity of lifeboats for their passengers, officers and crew. It was believed that on the busy North Atlantic route, assistance from at least one ship would be ever-present and that lifeboats would be needed only to ferry all aboard to their rescue vessels and back until everyone was safely evacuated. That scenario, unlike during the RMS Titanic sinking, played out flawlessly during the ship's sinking, and the six people who died were lost in the collision, not the sinking itself. Republic sinking by the stern after being hit by the Lloyd Italiano liner Florida. Captain Sealby and a skeleton crew remained on board Republic to make an effort to save her. Crewmen from the Gresham tried using collision mats to stem the flooding but to no avail. By this time the steamers New York and Lucania (from Cunard) had also arrived and waited while a futile attempt was made by Gresham to take Republic under tow. 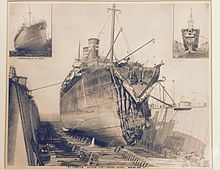 On 24 January, Republic sank stern first at 15,378 tons, she was the largest ship to have sunk until then. All the remaining crew were evacuated before she sank. The wreck of Republic was found by Captain Martin Bayerle in 1981. She lies upright approximately 50 miles (80 km) south of Nantucket Island at 40°26′0″N 69°46′0″W﻿ / ﻿40.43333°N 69.76667°W﻿ / 40.43333; -69.76667 in approximately 270 feet (82 m) of water. ^ "The Republic and The Delhi". Daily Telegraph. London. 16 April 1912. ^ Dunn, Laurence (1964). Famous Liners of the Past Belfast Built. London: Adlard Coles. pp. 70–71. ^ "SS Florida / SS Republic Collision (TBT)". Martin & Ottaway. 13 August 2014. Retrieved 26 May 2018. ^ "Ship Wrecks of New England - SS Republic". att.net. Archived from the original on 15 June 2006. ^ "Rescue at Sea". The American Experience. PBS. Retrieved 22 March 2012. ^ "Gresham, 1896" (PDF). Archived from the original (PDF) on 27 September 2012. Retrieved 16 November 2010. ^ "TITANIC - A Voyage of Discovery (allships)". Archived from the original on 24 May 2006. Retrieved 11 December 2018. ^ a b c Pickford, Nigel (1999). Lost Treasure Ships of the Twentieth Century. Washington, D.C.: National Geographic Society. ISBN 0-7922-7472-5. ^ a b "Treasure of the RMS Republic". New York: MVSHQ, Inc. 2009. Retrieved 22 March 2012. ^ Connolly, James B. (1945). Sea Borne - Thirty Years Avoyaging. Doubleday, Doran and Company, Inc. ISBN 978-1406768947. "CQD" by Alfred M. Caddell, Radio Broadcast, April 1924, pages 449-455. "The Triumph of Wireless", The Outlook, 6 February 1909, pages 294-297. RMS Celtic was an ocean liner owned by the White Star Line. The first ship larger than the SS Great Eastern in gross tonnage, Celtic was the first of a quartet of ships over 20,000 tons, dubbed The Big Four. RMS Adriatic was an ocean liner of the White Star Line. She was the fourth of a quartet of ships measuring over 20,000 tons, dubbed The Big Four. The ship was the only one of the four which was never the world's largest ship; however, she was the fastest of the Big Four. Adriatic was the first ocean liner to have an indoor swimming pool and a Turkish bath. RMS Majestic was a steamship built in 1890 for and operated by the White Star Line. The RMS Teutonic was a steamship built for the White Star Line in Belfast and was the first armed merchant cruiser. RMS Arabia was a P&O ocean liner. She was sunk in the Mediterranean in 1916 by a German U-boat during World War I.
SS Ionic was a steam-powered ocean liner built in 1902 by Harland and Wolff in Belfast for the White Star Line. She was the second White Star Liner to be named Ionic and served on the United Kingdom – New Zealand route. Her sister ships were SS Athenic and SS Corinthic. SS Cymric was a steamship of the White Star Line built by Harland and Wolff in Belfast and launched on 12 October 1897. She had originally been designed as a combination passenger liner and livestock carrier, with accommodations for only First Class passengers. During the stages of her design layout, it became clearer to the designers at Harland and Wolff that combining passengers and livestock had become rather unpopular, so the spaces designated for cattle were reconfigured into Third Class accommodations. She departed Liverpool on her maiden voyage on 29 April 1898, arriving in New York City on 9 May 1898. She spent the first five years of her career on the White Star Line's main passenger service route between Liverpool and New York, until 1903 when she was transferred to the less traveled Liverpool-Boston route, which she sailed on for nine years before being returned to the Liverpool route in 1912. The Big Four-class ocean liners were a quartet of early-20th-century 20,000-ton ocean liners built by the Harland & Wolff shipyard for the White Star Line, to be the largest and most luxurious ships afloat. The group consisted of Celtic, Cedric, Baltic and Adriatic. SS Merion was an ocean liner built in 1902 for the American Line, a subsidiary line of the International Mercantile Marine (IMM). She also sailed for the Red Star Line and the Dominion Line—both subsidiary lines of IMM—during her passenger career. After the outbreak of World War I she was bought by the British Admiralty and converted to serve as a decoy resembling the Royal Navy battlecruiser HMS Tiger. In May 1915, while posing as Tiger in the Aegean Sea, Merion was sunk by the German submarine SM UB-8. SS Magnetic was a passenger tender of the White Star Line built in 1891. She was laid down at the Harland and Wolff Shipyards in Belfast, Ireland. Magnetic was sold to a different company in 1932 and renamed Ryde, and scrapped in 1935. SS Canopic was a passenger liner of the White Star Line. SS Cretic was an ocean liner built in 1902. She was operated by several shipping lines, all of which were part of the International Mercantile Marine Company, under several names during her career, which came to an end when she was scrapped in 1929. The SS Scandinavian was a steamship ocean liner built at Harland & Wolff in Belfast which entered service in 1898. The ship changed names and owners several times; she was originally built for the Dominion Line and was known as New England, in 1903 she was transferred to the White Star Line and renamed Romanic. In 1912 she was sold to the Allan Line and renamed Scandinavian, the name which she retained for the rest of her career.